Neurological physiotherapy involves rehabilitation of people with neurological conditions. Neurological conditions are problems with the brain, spinal cord or peripheral nerves. People with neurological conditions may have difficulties with their physical functions including mobility, range of movement, muscle strength and balance. Neurological physiotherapy is a type of rehabilitation offering examination and treatment of the physical problems that are caused by an individual’s neurological condition. 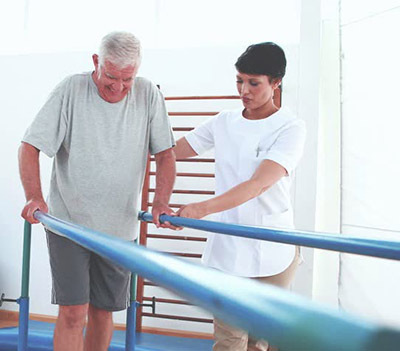 At Nightingale Physiotherapy we treat patients with many different neurological conditions including Stroke, Multiple Sclerosis, ALS and Parkinson’s. The brain is dynamic and capable of adapting to change following injury to the brain or spinal cord. Encouraging whatever movement is possible and building on it, through; strengthening, sensory stimulation, positive reinforcement, and verbal feedback. Prevention of muscle shortening as this leads to spasticity and abnormal movement. Implementation of realistic goals that are measured and time-framed. Neurological physiotherapy should commence as soon as possible following injury for the best possible recovery. Nightingale Physiotherapy use a combination of different neurological physiotherapy principles to provide the most beneficial treatment for our patients. These include the Bobath Concept (normal movement), the Carr and Shepherd Concept (motor relearning), the Brunnstrom Approach (synergistic movement) Conductive Education and functional rehabilitation. The treatment approach used varies depending on the individual, their symptoms and their goals. This allows us to maximise the potential of our patients. Following injury muscle strength and movement may be affected. Muscles may become weak or tight with spasms. There may also be changes to sensation and difficulties with speech and swallowing. Neurological rehabilitation is best provided by a specialist neurological physiotherapist. At Nightingale Physiotherapy our physiotherapists are experienced in treating patients with neurological conditions. Physiotherapy treatment will vary depending on your condition. Treatment will be specific to you and will focus on your needs. Physiotherapy treatment will increase your ability with everyday tasks and promote the functional activities that you value the most. This may include walking, climbing the stairs, shopping, gardening or simply being able to roll over and change position in bed, or transfer with assistance to your bed. Treatment may include stretching, strengthening, teaching you how to keep your balance and walking whatever your condition. Our motivated physiotherapists will help you achieve your maximum potential, your independence and optimise the quality of your life. An initial assessment will identify any problems caused by your neurological condition and a treatment plan will be developed suited to your needs. A structured rehabilitation programme will be developed including short and long-term treatment goals will be set between you and your physiotherapist. Neurological physiotherapy treatment can be carried out either at your home or in the clinic depending on your needs. To arrange an appointment with our Neurological Physiotherapist call 800 UAE (823).